I remember buying a fabulous book when Sonny was ready to be weaned. It was a lovely, colourful book of simple, basic puree recipes . The photographs in the book suggested that if I made these purees, my son would develop into a beaming picture of heath and happiness, and I would be an equally smiley mother, calm and in control, with wonderfully bouncy hair. ‘A moron could make this’! I exclaimed excitedly to Ed, as he squinted at the text in the book, flicked a few pages, muttered something and then returned to The Sun online. I remember skipping to the car, beautiful baby in arms, and flying off to Waitrose to buy veg. Back home I started with a simple butternut squash and pear mush. Sonny sat on the worktop in the kitchen in his newly purchased, blue bumboo seat. ‘I’m the real deal’ I thought, as I took in my recently cleaned kitchen, my contented son, my array of Cath Kidson kitchen adornments and my big squash and pear. I put my apron on and started peeling. Waitrose do bags of squash cubes, but I’d thought that was a cop out. 20 minutes in to the task of removing the rigid, tough skin, I wished I hadn’t started. It’s like trying to peel lyno off a hospital floor. I had arm ache and a mild sweat on. My mother was imminent and my imagination had previously conjured up the image she would be faced with; me, Sonny, bliss, shininess, successful weaning, perfection. She’d keel over with shock. By now I was only slightly less confident that I could make this happen. Returning to my book I realised that, in my excitement, I’d neglected to read the whole recipe. Some items of course, can be substituted. Some can be left out altogether. But you can’t really substitute a steamer. We didn’t own a steamer. We’d never steamed anything. We just weren’t steamers. My disappointment was palpable. Sonny must have sensed this, as only babies can, and started to warm his lungs up. I looked to my squash cubes and made a decision there and then. In the absence of steam, there was only one thing to do. Boil. I put hot water on. Boiling, according to the book, removes a lot of the nutrients. Steaming preserves them. I was robbing my son of nutrients. I looked at his angelic face; currently contorted into the face of a child that wanted to say ‘I am displeased with my current circumstances. Remove me from this ridiculous seat. Leave me be for a while whilst I recover from the fact that my squash cubes won’t be steamed’. I lay an agitated Sonny on his play mat and finished the rest of the puree. My kitchen a fall out zone, my child whingeing – the sound that only a hungry 6 month old can make, even my Le Creuset mini casserole pots looking somehow less desirable, less shiny, less expensive than usual. I swear that outside the sun went in and grey clouds formed above our house. In the book all the children seem to love their puree. There seems to be a lot of hand clapping and gleeful looks. But back in my house, Sonny in his high chair, pelican bib in place, puree cooled and on a spoon, the scene was less serene. He steadfastly refused to eat his puree. He would not contemplate it; he would not let it touch his lips. I persevered. He would not be beaten. I felt tired and wounded. My mother came in. I turned around to greet her. ‘That looks vile’ she advised, as I attempted for the seven-mizillionth time to shove a spoonful of orange stuff into Sonny. ‘I’ll just put these away’ she said as she procured 6 jars of Hipp Organic from a shopping bag. ‘They were so cheap; 3 for 2 so I got you 6’. Sonny grabbed the spoon from my hand and threw it at me. Most of it went in my recently washed hair. It was at that point that I let Mum take over with a jar of baby rice pudding, which Sonny wolfed, despite my noting from the label that it had not been anywhere near a steamer. That was the day I realised that doing things ‘by the book’ can sometimes result in more stress than it’s actually worth. I persevered though, and can say looking back nearly 2 years that approximately 40-50% of the mush that I got into Sonny was home steamed, the rest mostly courtesy of Ella’s kitchen. Yes, we bought a steamer. It cost too much and takes up too much room. And now it gets far too little use. But we bought it for Sonny because, irrespective of cost or convenience, and with even less respect to guilt and exhaustion, who doesn’t want to do the best by their kids? 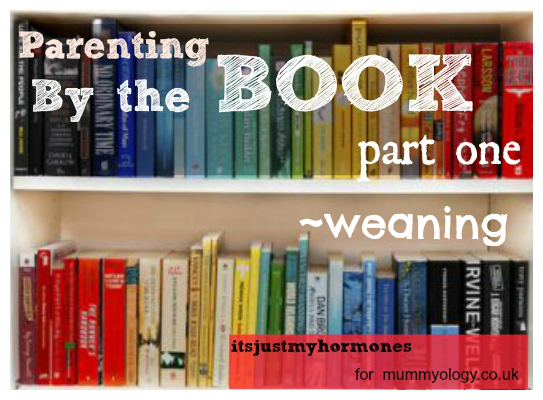 Parenting by the book part two: controlled crying Hello Again How to be a proper mother Book Review & Giveaway – The Tall Poppy Project Two’s my perfect number, whats yours? Sentimental Sunday mush! Back to the Start How to live with your husband for the rest of your life part one. I loved this story! You told it so well! I agree, sometimes you have to put those ‘expert’ books away, high up on a shelf, and learn through the seat of your pants (and let grandma do her ‘thang’)! I pinned you here http://pinterest.com/zina/the-parent-water-cooler/ and here http://pinterest.com/lnmontessori/mom-lit-the-best-of/!